Empower learners with the ISTE Standards — download this free classroom poster today! 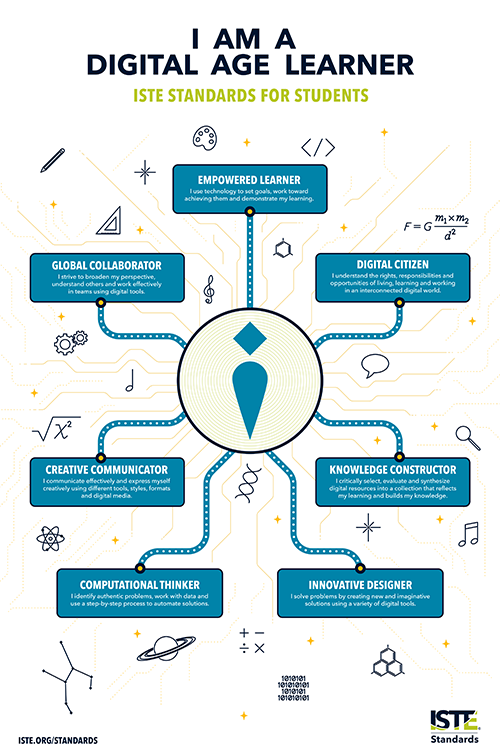 Bring the recently refreshed ISTE Standards for Students to your classroom with the free poster, "I am a digital age learner," and empower students to become future ready, lifelong learners. Subscribe to download the free poster and get updates on standards resources and tools. A road map for transforming education, the ISTE Standards help innovative educators like you re-engineer and reimagine their classrooms and schools for digital age learning. They are a guide for amplifying and empowering learning, no matter where you are on the journey to the effective and meaningful integration of ed tech.